Just up the alley from Marliave is a much different, lesser-known establishment. In fact, if you weren’t specifically looking for the Barracuda Tavern, you probably wouldn’t find it. Nor is it the sort of bar you’d necessarily stumble upon; with a discreet sign, nondescript door, off of a sidewalk filled with overflowing trash cans, it might not even be the kind of place you’d walk into even if you did realize it was a bar… But actually, it’s a pretty good one. Just beyond the narrow black door off the dark alley that is Bosworth Street is a staircase leading to what almost feels like a private party that you weren’t supposed to know about. Up those stairs is a bright, unusual bar with a good menu, plenty of beer and cocktail options, and a small crowd of after-work patrons. The Barracuda Tavern revels in a nautical theme – from its name, to its décor, to its food and drink offerings. There are ship wheels, large and small, everywhere; a full-size rowboat right in the middle of the room; kitschy crustaceans on the wall; fish-themed art for sale; and a jukebox that only plays songs like “Beyond the Sea,” “The Ocean,” “Under the Sea,” “Blow the Man Down,” and other seaworthy songs (kidding about that last part). Having only opened in 2010, Barracuda still feels very new. It’s a small, attractive space, with hardwood flooring, an entire wall of exposed brick, and large windows that look out onto the street. Red lights hang over a modest, L-shaped bar that only sports about five or six seats. Still, there are plenty of tables to sit and stand around, giving the room a cozy but open feel. When I arrived around 5 p.m. on a Tuesday, there were about a dozen people, and maybe half that when I left a couple hours later. I’ve heard it can get packed on occasion, but it’s always been pretty quiet and comfortable whenever I’ve been here. I first heard about Barracuda shortly after it opened. It was right near my office, and since my work friends and I were wearying of the local options, I was thrilled to have a new place to try. So I mentioned it to my good friend and coworker, Jen, who heartily agreed that we should check it out sometime. She then went without me and reported back about how cool it was. Poor form, Jen. Poor form. I finally scoped the bar out for myself not long afterward, and it became a regular haunt of ours for a while. I even made Jen’s ringtone on my phone “Barracuda” by Heart, given her fondness for the place (I’ve since changed it to “Jenny” by Tommy Tutone, but she doesn’t need to know that). Jen accompanied me on this particular occasion and, as usual, Barracuda didn’t disappoint. Barracuda offers a fun cocktail menu that sticks to the seafaring theme, with names like Gilligan’s Fog, the Nor’easter, the Irish Fisherman, and the Skipper, among others. My evening began with what seems to be the signature drink here – the Cuda Runner. 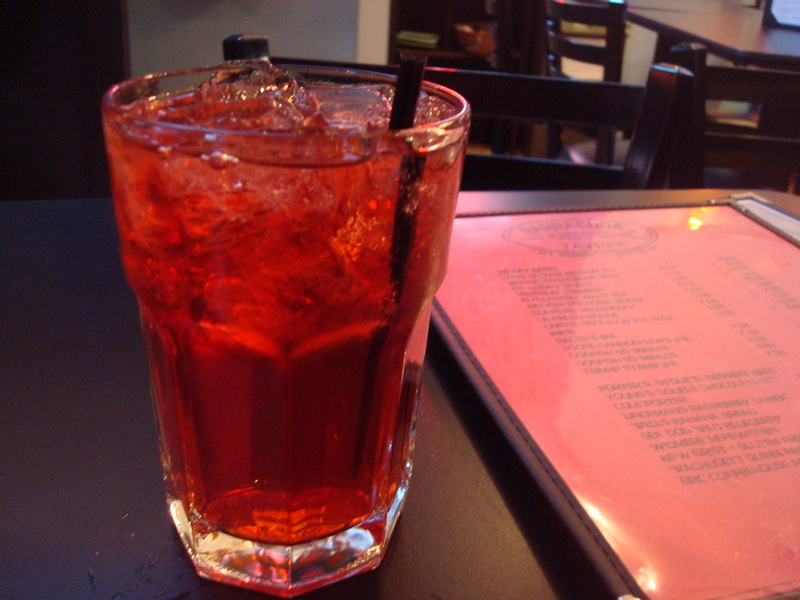 It’s a tropical concoction of vanilla, coconut, and spiced rum, with a splash of cranberry juice and lemonade. A perfect drink for this summery weather we’ve been having here in Boston (in March!). The food menu favors seafood (who would’ve guessed?). The entrees include the usual staples, like fish and chips, scallops, a grilled catch of the day, that sort of thing. There’s a sandwich menu that caters more to land lubbers, with an impressive-sounding steak sandwich and a Cuban sandwich that, for reasons I can’t begin to explain, I have yet to try (I could start a whole separate blog about my love of Cuban sandwiches and my quest to find the best around). I confess I’ve never gotten past the appetizers, which are plenty pleasing. 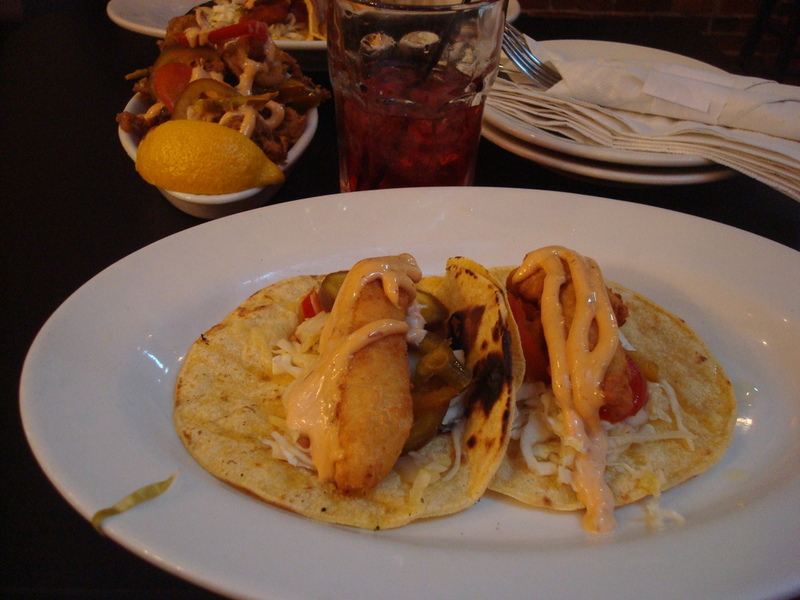 Jen and I went straight for our old standby – fish tacos. Usually you get a satisfying plate of three for $8; not a bad deal if you don’t feel like shelling out your hard-earned doubloons for an entrée. But to our delight we discovered that Tuesday was $2 Taco Night, so we got two apiece and split an order of calamari. Oh, and if you love tacos but hate fish, you’re in luck – chicken or beef tacos are available as well and, if you’re feeling indecisive, you can mix and match to your heart’s content. Covered with jalapenos and a spicy chipotle sauce, these bad boys had a major kick to them. The calamari was topped with spicy cherry peppers and a Cajun aioli, which just added to the heat. Our mouths aflame, it was time for a couple of beers. Barracuda’s draft selection is small but respectable. Amid the usual suspects like Guinness, Stella, and Bud Light are slightly less common offerings like Drifter Pale Ale, Leffe Brown, and Pilsner Urquell. Barracuda either no longer carries (or was simply out of) Shipyard, which was a little disappointing; this used to be one of the only bars in Boston that consistently had Shipyard on draft. 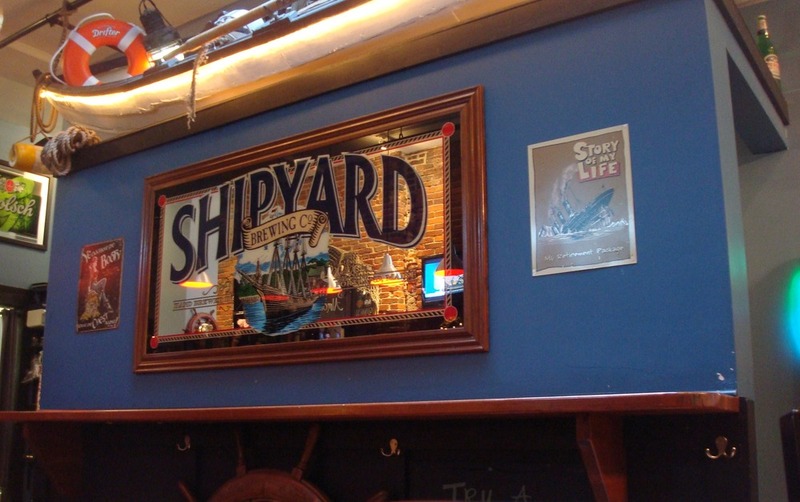 Plus, for a bar with a nautical theme and a huge Shipyard sign in the middle of the room…I mean, come on! The selection of bottled beer, on the other hand, is stellar. 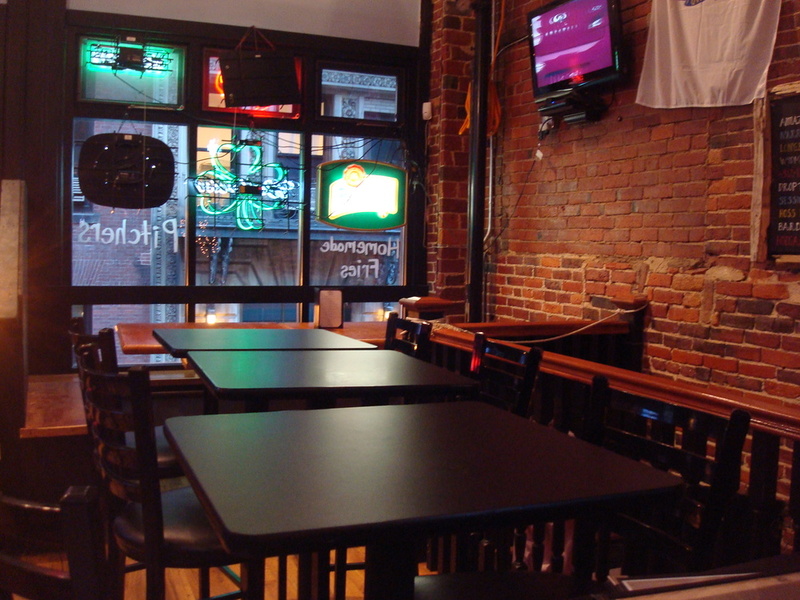 The Barracuda Tavern boasts one of the better selections of microbrews in the city. The beer menu even has a separate section of porters, stouts, and dessert beers, with such options as Maine’s Coal Porter and the rich Young’s Double Chocolate Stout. Jen opted for a Leffe Blonde, and I rounded out the night with a refreshing Cisco Whale’s Tale. Sufficiently full from appetizers, that Cuban sandwich would have to wait for another visit. As Jen and I sipped our suds and commiserated about discussed our shared appreciation for our jobs, I began to wonder why I don’t stop in here more often. It’s a really charming bar, never crowded but never dead, with consistently friendly service and good beer. It’s not the highest-profile option in the area, but something about the cozy atmosphere makes me hope it stays that way. The Barracuda Tavern is an unusual, underrated bar worth seeking out. The cocktails are a little on the pricey side; I’m not sure a Dark & Stormy needs to go for $10. Lower-end beers, like PBR, Narragansett, and Schlitz (!) are $4 – a little excessive for mildly alcoholic water, especially since those beers can be found more cheaply elsewhere in the vicinity. But the microbrews are priced just right, and if $2 Taco Tuesday isn’t enough of a bargain for you, Wednesday is $0.25 Wing Night. The best thing about the Barracuda is that it’s a quiet refuge hidden away in the heart of the Financial District. Stopping in is especially refreshing on a raw, rainy day in Boston, when you can slip down an obscure alley, ascend a flight of stairs, and step into a laid-back bar that makes you feel, even just for a while, like you’re vacationing on the seaside.